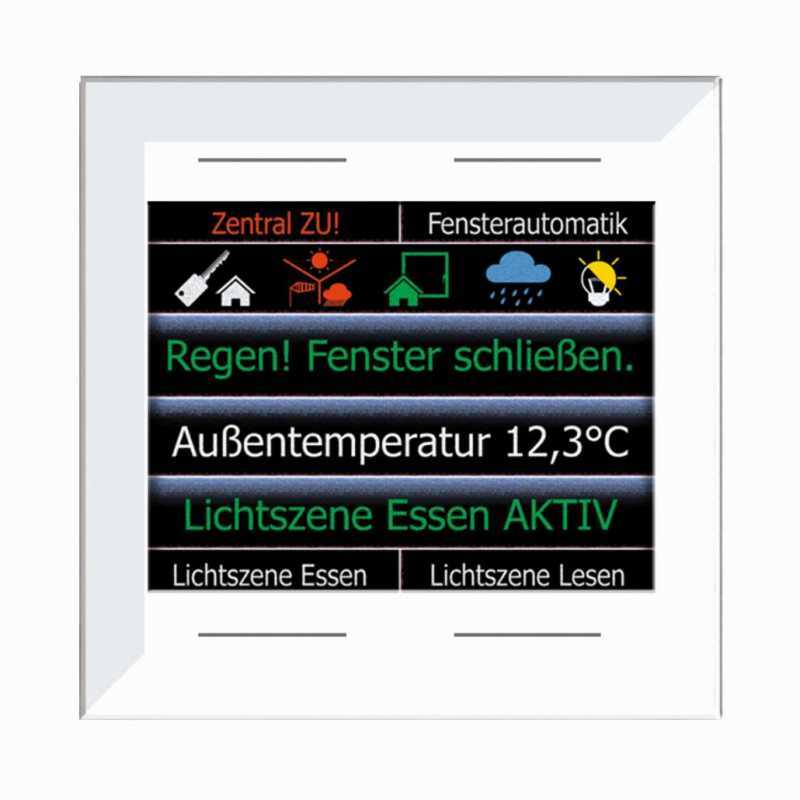 The LCN-GT4D is an info-touch keypad with a TFT-Display. It is designed for mounting in a flush mounted wall-box and is fixed firmly to the wall with plastic slide-fittings. The LCN-GT4D is meant for use in interior dry rooms. It can be used for every switch, regulator and control task within the LCN bus system. The integrated temperature sensor allows the user to control the temperature. On the left and right side of the display, a bar graph can be displayed, in which up to two values can be marked. The bargraphs are configured with the LCN-PRO, up to colors and gradients. The keypads are connected via the I-Port of any LCN module as of version 140719 (July 2010). The 4 capacatively functioning sensor surfaces are arranged behind a glass panel. A light touch of the surface is all that is required to initiate different functions. The intelligent control system distinguishes between ‘SHORT, LONG and RELEASE’ so that 3 commands are possible for every key. The sensor surfaces can be digitally labelled on the display. Symbol-Line: A maximum of six symbols can be displayed on the top-line of the screen. These symbols must be assigned to a binary input, relay, output or a logic-function and react to their status messages. Text-Line: When using font size 20, every one of the four text lines can have a max. of 63 characters entered, of which 19 -23 characters are visible (auto scroll function). The text lines 1 -3 can be adjusted to double the line height (font size 40) and occupy two lines. Key labelling: A text for labelling the four keys can be entered. The text can be a max. of 25 characters long (without auto scroll). Alternatively, the display can show four lines of text if labelling the keys is not necessary. The LCN-GT4D uses several languages which can be adjusted during operation: German, English, French, Spanish, Polish, Turkish, Russian and Arabic. The LCN-GT4D is for mounting in interior dry rooms. It can be used for every switch, regulator and operational task within the LCN bus system. It is especially suited to the design orientated user who demands high performance and comfort.